Poetry and Jazz on Sunday Nov 4th - Go Foxburg! After the Phantom disappears into the dark come back to the light on Sunday afternoon November 4th with ARCA’s third Poetry and Jazz combination. In the tradition of a 50s and 60s coffee house, ARCA welcomes CUP Poet, Philip Terman and members of Catro, and friends for an afternoon of verse and notes, at Lincoln Hall in Foxburg, Sun., Nov. 4th at 2:00 PM. 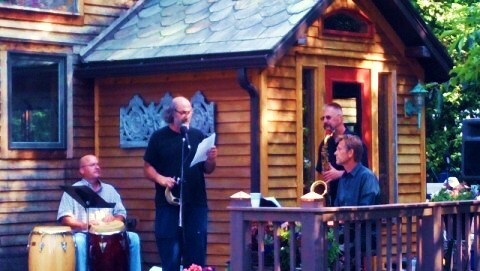 Philip Terman, author of six books of poetry, will read his poetry while accompanied by members of the jazz ensemble Catro. Terman has read his poetry in many venues across the country. The event will feature collaborative pieces with Terman and the group, as well as an individual set by the band and a reading by Terman. Catro is led by Mark DeWalt. Mark is a freelance musician residing near Grove City, and he appears regularly playing piano and keyboard throughout the region. He has been the leader of the jazz band CATRO for over 20 years. Playing Tenor Saxophone will be David Kana. David works extensively throughout the region with numerous ensembles playing in every style of music. Carlos Cintron will add to the moment on the Conga Drums and Percussion. This year Phil is joined by fellow poet Andy Johnson of Slippery Rock. Poet Andy Johnson has been writing, publishing, and giving poetry readings in Michigan and western Pennsylvania for the last forty years. Andy regards the spontaneity of poetry/ jazz as something unique: “During the poetry/ jazz experience everyone including the poet, the musician, and the audience gets to participate in the creation of something which always manages to be new.” He will be joined by saxophonist Terry Steele. Terry is a retired Professor Emeritus from Slippery Rock University is now a freelance musician in the Pittsburgh area where he is active playing musicals, backing entertainers, playing jazz venues and when needed is the principal saxophonist with the Pittsburgh Symphony. Tickets for Poetry and Jazz are Adults $10 and students $ 5. For ARCA info visit www.alleghenyriverstone.org. As always when in Foxburg on the weekend stop by ARCA’s artisan coop the Red Brick Gallery on Main Street. Current show in the Upstairs Gallery is New Works – Mixed Media Featuring Clarion’s Amanda Lewis pottery and Carol McDonald creations. This event is on Sunday, Nov 4th.